Imagine if the impeccably organized and eminently sensible Miss Felicity Lemon (private secretary to Mr. Parker Pyne and M. Hercule Poirot) were to assemble her own collection of crime fiction.... Here she recommends and discusses the choicest whodunits ever written. Miss Lemon is not entirely sure it's fair to saddle The Blank Wall, by Elisabeth Sanxay Holding, with the Forgotten Friday label. Nevertheless, from the book's original publication in 1947, it has had a tough go at remaining at the forefront of the reading public's mind. Efforts by such discerning literary admirers as Raymond Chandler, who entreated his publisher, Hamish Hamilton, to bring Mrs. Holding's works to England, came to naught. Even laudatory reviews that appeared in respected periodicals such as The New Yorker, and the adaptation of The Blank Wall into two cinematic hits -- first The Reckless Moment in 1949 and then The Deep End in 2001 -- did little to keep this gem of psychological suspense from slipping the collective cultural memory. A pity, as this wartime story of one woman's snap decision to conceal the body of a man who may or may not have been murdered by one of her family has a resonance one doesn't soon forget. Isn't it always the thing done on instinct, without a moment's thought, that causes one the most trouble to explain later? Certainly that's the case for Lucia Holley, who is forced again and again to choose between the urge to protect her family and her own peace of mind. 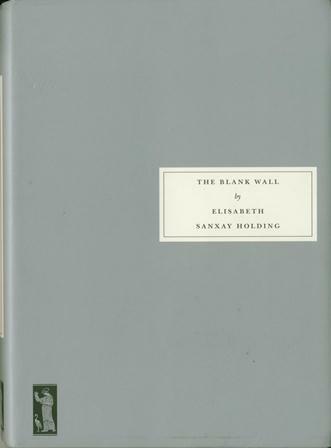 Fortunately for us, those wonderfully intuitive editors at Persephone Books chose to republish The Blank Wall as Book No. 42, and the novel has been saved, in Miss Lemon's view, from obscurity. The publisher's note in the Persephone edition rightly points out that the acuity with which Holding depicts the psychological underpinnings of her characters' motivations sets the bar for the British masters of the genre who were to follow her: Celia Fremlin, Ruth Rendell, Margaret Yorke. Indeed, Miss Lemon's readers who enjoy any or all of the aforementioned authors will most certainly enjoy The Blank Wall. I loved The Blank Wall too. I'm a Persephone fan & I enjoy anything they publish but this was a thriller with that Persephone touch. The domestic details & the characterization were terrific. Miss Lemon couldn't agree more. It seems like the details of how WWII changed the landscape of home life -- taking taxis rather than using one's own petrol, the rationing of the blue and red coupons, the best day to visit the grocer, etc. -- are fast being forgotten but are wonderfully brought to life in this novel. 1. All Souls, by Javier Marias; translated into English by Margaret Jull Costa. Elizabeth is a bibliophile and connoisseur of the British mystery. In 2016, she will launch Lemon Cottage Press, an imprint that republishes neglected and out-of-print mysteries whose charms have only increased with the passage of time.